Call or email for more information to see how SkyHeld Cameras can work with you to bring you up to date site information when you need it. We appreciate that drone aquired imagery and data often needs to remain confidential. We fully comply with any confidentiality requirements. The images below are with agreement from site management. When operating drones on construction sites with active cranes we plan our flights taking arc of movement and load pickup/set-down points into consideration. This is part of our Safety Management System for providing safe drone services for construction sites. With the BIM level 2 mandate which came into effect in April 2016, all UK government and public sector construction projects are required to use a Building Information Modelling methodology. This improves collaboration across the project and reduces costs by providing a unified digital documentation repository for management of the construction and associated utilities. This offers significant benefits with the Soft Landing approach for improved handover and ongoing building operational performance during a building's lifecycle. High resolution images, orthomosaic maps, Point clouds and 3D Models produced using our drones can prove to be an invaluable additional resource for construction project documentation. This data can be imported into ArcGIS, AUTODESK Bentley and other GIS systems, providing a simplified faster workflow. This is a video of a construction site 3D Model captured and assembled with DroneDeploy, just one of the products we use to obtain aerial images (courtesy of Hover Visions, OK.USA). The same data can also be used for instant approximations on distance, area and volume..
For more accurate measurements, contraints against known distances can be incorporated for relative accuracy. An A0 printout or a projection/display of a recent drone captured image is a great enabling tool for client briefings or progress/planning meetings. It enables focussed discussions with the subject clear for all to see. Our clients and their clients have found this very useful in meetings. Similarly, an overflight video can convey both general and very specific information about the site or specific areas of the site in an easy to remember way. Construction and safety managers can benefit from flyover videos and photographs to check for site anomalies and issues before they become a major problem. These images and video can be used for new site worker inductions, clearly showing the site layout and any hazard areas in an easy to assimilate fashion. According to the Health and Safety Executive's information on working at height, falls from height remains one of the biggest causes of fatalities and major injuries at work with an average of over 50 fatalities and 8700 serious injuries from falls across all industries in Great Britain per year since 2001.
" Every employer shall ensure that work is not carried out at height where it is reasonably practicable to carry out the work safely otherwise than at height." The government's 2014 overhaul of guidance on working at height restated in Key Messages the requirement for employers to avoid work at height where reasonably practicable. For traditional inspections at height, even before any remedial work is deemed necessary, a risk assessment, safety plan and fall prevention and limitation equipment installation is required before a worker can proceed with an inspection at height. When considering the working at height regulations and the cost of risk assessments, safety planning, set up time and hire of scaffolding, towers, cherry pickers etc, a drone can be a far more versatile cost effective alternative, particularly for inspection of larger areas, multiple areas or extreme heights such as tall buildings, towers and chimney stacks where significant time and money is spent on access even before an inspection can begin. A drone can be deployed and providing clients with high resolution imagery in less time than it would take to do a risk assessment for access equipment for many inspection tasks , let alone the installation of such access equipment. Rather than waiting for scaffolding to be erected - and the disruption this can cause, a drone can be onsite deployed and gathering visual inspection images and video up to 400 ft high within 15 to 30 minutes of commencement of the task (the time it takes to carry out a typical on-site flight risk assessment and setup the drone). 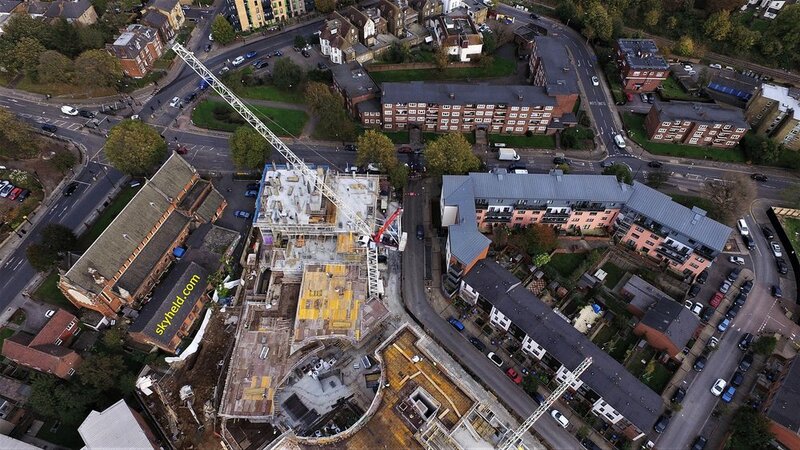 With no ongoing scaffold hire charges and further disruption during scaffold dismantling, a drone is a much more effective and less intrusive option for visual inspection at height. Images and video are stored on an on-board SD card and sent via an online download to the client for viewing. They can also be viewed live from the ground in high resolution and an inspector/surveyor can direct the flight to achieve stills and video as required. The video and stills that are obtained are very detailed (up to 4K & Ultra High Definition video) and can be used to quickly determine if further investigation is necessary. A drone can achieve close up, top down and side level views from any position over the area of interest, views that may not be available by any other means. e.g. a cherry picker may not be suitable for access to all areas around a building or other infrastructure. This of course does not necessarily negate the need for a full inspection by an experienced surveyor/inspector where an issue has been identified, but it can significantly reduce costs, disruption and risk to workers by identifying those instances where remedial work at height is not required. This allows for work at height resources to be allocated much more effectively only where they are needed. Drones offer significant cost savings over manned aircraft for construction progress photography. They can attain viewpoints that are often unobtainable by manned aircraft that have to maintain an altitude much higher than drones and therefore cannot get those lower angle perspectives that give so much detail.